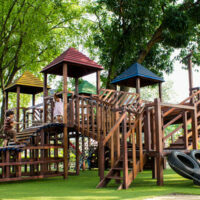 Who is Liable for My Child’s Playground Injury? Many children choose to spend their time outside, often in a neighborhood park or playground. While many playground accidents result in minor scrapes and bruises, the reality is that many playground-related injuries are much more serious. In fact, the Centers for Disease Control and Prevention (CDC) estimates that emergency rooms across the country treat more than 200,000 children under the age of 14 years old for playground accident-related injuries every year. Collecting compensation for medical bills can be difficult in these types of cases, especially if the playground was owned by a public school or a municipality, so if your child was injured while at a playground, you should consider contacting a premises liability attorney who can help explain your legal options. A lack of platforms or guardrails. Often, these types of hazards are caused by inadequate maintenance by the city or the school board or by the use of inferior materials during construction. In these cases, the parents of injured children may be able to collect compensation on their behalf to cover the cost of treatment. The defendant’s negligence was a major cause of the child’s injury. When these requirements are met, plaintiffs can recover damages to cover past and future medical bills, pain and suffering, and lost wages. If your child was injured on a playground and you believe that the owner’s negligence caused or contributed to the injury, please contact Boone & Davis at 954-566-9919 today to schedule a free consultation with an experienced and compassionate Fort Lauderdale attorney who can evaluate your case. We are prepared to assist you immediately.